In the previous chapter, we presented approaches that capture incongruity within target text. However, as observed in errors reported by these approaches, some sarcastic text may require additional contextual information so that the sarcasm to be understood. This is true in case of sentences like ‘Nicki Minaj, don’t I hate her!’ or ‘Your parents must be really proud of you!’ These forms of sarcasm can be detected using contextual incongruity. Here, ‘contextual’ refers to information beyond the target text. 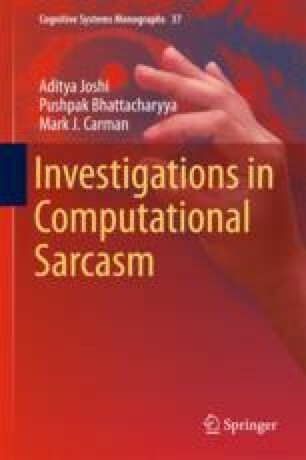 In this chapter, we present approaches that capture contextual incongruity in order to detect sarcasm. We consider two settings. The first setting is a monologue (in Sect. 4.1) where a single author is being analyzed. In this case, we consider the historical context of the author, i.e., the text created by the author of the target text and create a sentiment map of entities. The second setting is a dialogue (in Sect. 4.2) where multiple participants take part in a conversation. In this case, we use sequence labeling as a novel formulation of sarcasm detection to capture contextual incongruity in the dialogue.